We are not really sure what GL & L stands for at the GL & L Smokehouse in Susanville, California. This was our destination on our Meat Adventure before our barbeque contest last weekend. GL & L is located just out of town on a rural road. The giant pink pig out front reassured us that we were at the right place. I had also asked the owner for directions who I had met at the Susanville farmers market earlier. There was not a whole lot to the inside of GL & L but a few refrigerator/freezer cases. They were chock full of tasty meat products. Bacon, ham, jerky, marinated meats, smoked pork chops, pepperoni, and several flavors of house made sausage. They had a printed list of meat combinations you could buy for a specific price. One thing we noticed was the very reasonable prices. We are so used to the inflated Bay Area sin tax adjusted sticker tags that we were pleasantly pocket book surprised. There was not any slab bacon but thick and thin sliced house smoked that we put in our cart. Smoked pork chops, several sausage flavors and bacon all made it into our cart. We met the owners soft speaking Father who was very nice. His wife generously gave us some ice packs for our portable ice cave. GL & L has small town charm that we love. 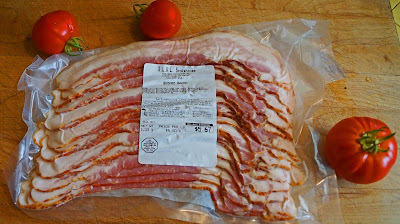 We have sampled the bacon since our return and can say it is very decent and made some very tasty BLT's. The next time we are in Suanville we shall return. Always hard not to leave a place like that with a cart full. Big Dude, This Meat Adventure was light on the pocket book but heavy on flavor. I am looking forward to trying the sausage.